Activists in Albany, California have staged an occupation of a different kind of public space—a farm. Early Monday morning, around 100 University of California police raided a five-acre patch of land owned by UC Berkeley and used occasionally for agricultural research. The raid came three weeks after roughly 200 activists, community members, and students took over a small patch of the land, known as the “Gill Tract,” located in the small city of Albany, just north of Berkeley. 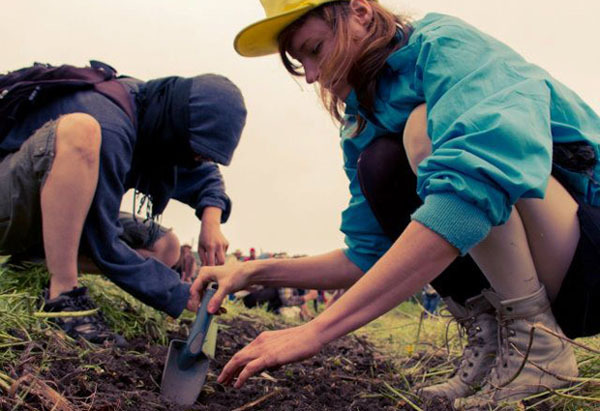 The group cleared out piles of wild mustard, tilled the soil, planted 15,000 donated seedlings, and set up camp. When the university ordered them to leave, they kept farming. The university responded by cutting off water access, setting up barricades, and then filing a lawsuit against 14 people. On Monday, nine protesters were arrested and part of the farm was bulldozed. The land in question has a long and convoluted history. The university purchased the Gill Tract from the Gill Family in 1928 to use for its agricultural research. Since then, it has parceled out and sold more than 90 percent of the original 104 acres. The movement to turn the Gill Tract into a center for sustainable urban agriculture dates back more than 15 years. 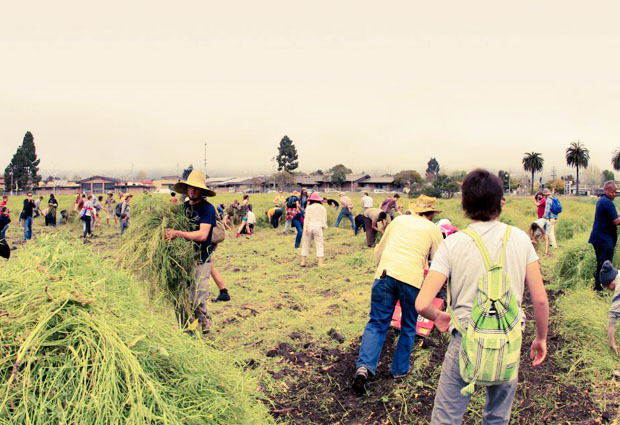 The first proposal, drafted in 1997 by a coalition of more than 30 non-profits and community organizations in the Bay, asked that the UC enter into a community partnership to create the nation’s first center on urban agriculture and sustainable food systems as a response to issues of “food security, economic development, poverty alleviation, urban blight, waste recycling and environmental preservation.” Since then, many of these issues have moved from the cultural fringe into the limelight. And yet, the movement to turn the Gill Tract into a community space has been repeatedly shut down by the university. photo by Subconscious CollectiveAnd so, feeding off the energy and optimism of the past year’s Occupy events, the activists decided to act without the university’s blessing to realize their vision for the space. When I first heard about Occupy the Farm, I felt conflicted. Full disclosure: I am friends with several of its central activists, many of whom have long-standing commitments to urban agriculture and sustainable food in the Bay Area. I am also, by some measure, a scientist. I graduated from UC Berkeley with a degree in Molecular Biology, and as such can sometimes feel at-odds with an agricultural movement that can often jump the gun on vilifying science: contrary to popular opinion, all roads do not lead to Monsanto. I decided to go visit the Tract last Saturday—just days before the raid—and found the farm pristine: Colorfully painted wood signs stuck in the rich black soil cheerfully advertised endless rows of three sisters (beans, squash, and corn), lettuce, basil, and more. I’d arrived in time for a meeting about the future of the farm. The event was conducted on both sides of the UC-erected fence, which the protestors could cross if they wanted via a ladder and slide they’d set up so that they could still water their freshly planted crops. A few UC police stood to the side of the fenced-in area, idly watching. During the meeting, the activists discussed various long-term visions. In the future, after their tenuous relationship with the university was somehow resolved, would they parcel the land to individual low-income families? How would they distribute the food? What about animals? Would they build a playground? What exactly the researchers are doing on the Gill Tract, and who is funding it, has been a source of some confusion. Many protesters told me that they believed the research was “for Monsanto corn” or “on genetic markers used to make new mutants.” The activists are also troubled by the fact that Lisch started his career at Berkeley because of a $950,000 grant from pharmaceutical industry giant Novartis, and the fact that he already holds two gene patents. Yet the research being conducted now on the Gill Tract is all pretty squarely defined as “basic science” research—figuring out the very fundamentals of how, in this case a genome, works. (Specifically, Lisch studies transposons, which are segments of DNA that can hop around to different, usually random, places on the genome.) According to most of the scientists I spoke to, applications for industrial agriculture are actually pretty far off. But after spending some time on the farm I realized that the underlying issue was not a bigger battle with the science or even the hard-fought values battle with the university—it’s about the land and the community that has long stood to benefit from it. 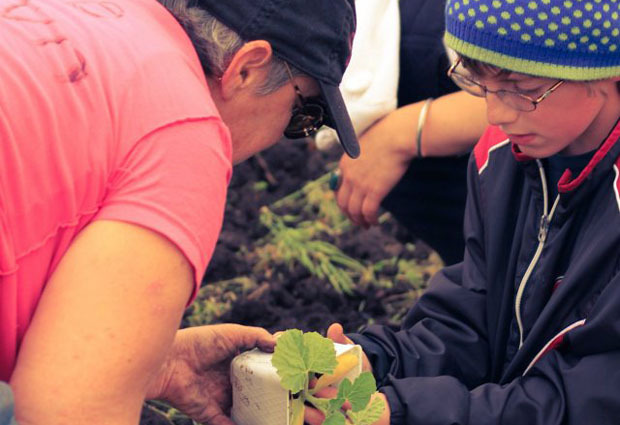 A growing body of research has shown that urban farms both increase healthy food intake and overall psychological well-being in communities where they’re successfully established. Indeed, looking around at the motley crew of protesters—students, old people, dreadlocked hippies, small kids, and farmers—passing water buckets over the fence to feed the plants before sunset, I finally understood what this space would mean to them. This little town has been staring at the university’s mostly unused plot of land for decades; now they were looking at something that they had made their own.